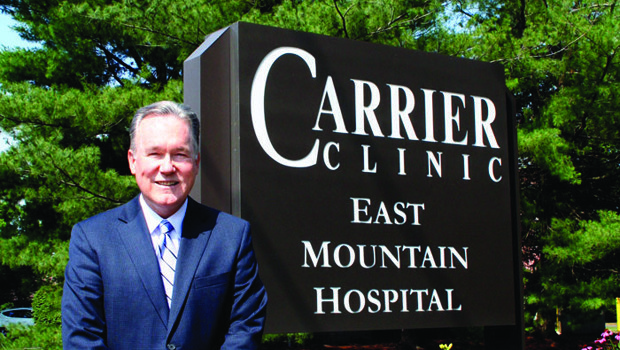 Donald J. Parker is the CEO of Carrier Clinic, located in Belle Mead, NJ, at the foot of the Sourland Mountains. In this rural setting, patients are treated for mental illness, behavioral disorders, and addiction. They also maintain a state-approved special education school called the East Mountain School for students in grades 7 through 12. Carrier Clinic operates a very large campus complete with gymnasiums, modern cafeteria, amphitheater, chapel, picnic areas, as well as facilities used for equine and animal therapy. The Active Seniors Program (for adults ages 60 and older) employs a variety of therapeutic techniques to treat mental illness among seniors. In 2009, Carrier Clinic dedicated 15 acres of land for solar panel installation, the largest ground-mount display for any hospital campus in New Jersey at this time. What is your background and where did you work prior to coming to Carrier Clinic? I have been at Carrier for 20 months after a 27-year career at AtlantiCare Health Services in Atlantic County where I served as President. I was responsible for Mental Health and other Health Services including Urgent Care, Home Care, Hospice, a large Day Care and Preschool Education network, multiple outpatient and specialty Physician practices, a Medically Integrated Health & Fitness Center, and a Federally Qualified Health Center. I came to Carrier as the last stop in my career, for the opportunity to lead New Jersey’s largest and oldest private psychiatric hospital. I am a licensed clinical social worker and felt that I could make a contribution in a field where my initial career started and my heart still belonged. What is the Equine Assisted Psychotherapy Program? Carrier has several clinical staff who are certified in Equine Therapy. We have horses brought to our campus weekly for our therapists to engage in a specially designed program that engages patients with the horses in an effort to learn about themselves, other people, and interacting with the world. The results are startling. Even adolescents with severe anti-social or aggressive behavior become calmer and more communicative. It’s not about riding or handling horses, it’s about the interaction and learning between the horse and the adolescent. How does East Mountain School help students in grades 7 through 12 dealing with emotional and psychiatric illness? East Mountain School combines academic, behavioral, and counseling services in a nurturing environment, with small class sizes, a 7 to 1 teaching ratio, and a wide array of school subjects to assist disaffected students in achieving success in school. Our focus is to return the students to their home district with the necessary life and academic skills required for them to graduate and pursue their collegiate or vocational goals. What kind of substance abuse and addiction treatment services does Carrier Clinic offer? Carrier’s Blake Recovery Program offers multiple alternatives for reducing dependency including Psychopharmacology as well as therapeutic strategies, both group and individual. We also blend physical exercise, group sports, swimming, and equine therapy into our programs in order to encourage healthier lifestyles. In what ways is Carrier Clinic specifically serving the young adult population (ages 18-25)? Carrier provides a significant array of services for young adults. In our Psychiatric Hospital, we generally have about one-third of our patients in the 18-25 age range with most diagnoses including some type of depressive disorder. We treat the patients with both Group and Individual Psychotherapy, Psychopharmacology, Creative Arts Therapy, and other forms of Mindfulness Training. Our Blake Recovery Program generally has over 50% of the patients in this [young adult] age category. Our program is based on The Twelve Step Process with significant group and one-on-one counseling. Our Detoxification Program employs state of the art medications, which assist us in managing the physical side effects of eliminating substance abuse. A full array of mindfulness activities are used in the treatment programs as well. Are there any programs and support networks at Carrier Clinic that are available to the general public? Carrier operates several support programs including a weekend program for the families of drug and alcohol abusers, which is focused on teaching the members how to assist and support in the recovery process that their loved one is engaged in. We also offer Alcoholics and Narcotics Anonymous Programs on-site throughout the week to introduce patients to available community support. Talk about Carrier Clinic’s plans for the future. Over 100 double-hung windows will be used as canvases by local artists, creating our “Windows to the Future Project.” We preserved 6 trunks from trees that were being removed during construction and are allowing local artists to carve them into totems for use in our gardens. We have added a significant number of new therapeutic programs focused on the arts. We have established a relationship with the Arts Council of Princeton whose staff are engaged in exposing our adolescents to a wide variety of art forms as a means of managing stress. Our Healing Arts Program has purchased over 80 new pieces of art from local artists that embody healing properties. These new artworks will be placed throughout the hospital. We have launched the first Compassionate Care Index, which will be administered to our patients in order to secure feedback about how compassionate our staff are in delivering care to patients. We will be using the information from the survey to assist in hiring staff who are more compassionate, train the skill of compassion, reward compassion from our staff and prevent compassion fatigue. We submitted a grant application to the Center for Medicare and Medicaid Services to create 6 Behavioral Health Urgent Care Centers that will focus on providing on demand evening, weekend, and holiday services for patients who are experiencing mental health issues that need attention, but don’t qualify for hospitalization.